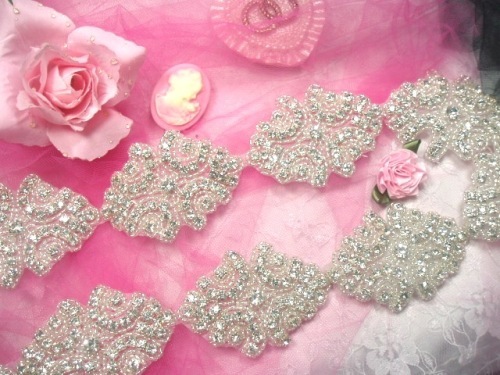 0477 Cinderella Genuine Rhinestone Beaded Trim 2"
Catalog > 0477 Cinderella Genuine Rhinestone Beaded Trim 2"
0477-SLCR Cinderella Rhinestone Beaded Trim is an all-around fit for pretty projects of all kinds. From children’s costumes to bridal accessories, you’ll never run out of uses for this beautiful, repeated crystal rhinestone pattern. Each section of genuine rhinestone beaded trim for sale measures one yard, and the individual appliques which make up the length are 3”x2”. Use the length to trim your bridal gown, or cut the individual rhinestone appliques and combine them to create unique looks all your own. Orders of more than one unit can be shipped as a single length.